A well-trained operating engineer working in the pipeline industry is safer and more productive, resulting in a better-finished product for owners, contractors, and the public. Top-notch skills training adds value to projects for the pipeline contractors and a more rewarding career for members of the IUOE. Safety and productivity are guiding principles for both the IUOE and the Pipeline Contractors Association (PLCA), which was established in 1948 as a means for the various pipeline contractors to encourage safe and efficient practices in pipeline construction, to negotiate labor agreements, and to resolve the problems commonly encountered by those working in the industry. In sharing these goals, the IUOE and PLCA joined forces to create the National Pipeline Training Program, and work tirelessly to assure the public of the skill, integrity, and responsibility of the members. The program is open to active members of the IUOE from the United States and Canada, and offers courses at two training facilities. The main site is the IUOE International Training and Education Center (ITEC) located just outside Houston, Texas. The second site utilizes the training facilities of IUOE Local 181 in Boston, Kentucky. Courses offered at the International Training Center consist of beginner, intermediate, and advanced pipeline training with angle dozers, excavators, and sidebooms. In addition, specialty excavation classes for waterway/creek crossing, mat handling, and bridge building, along with excavation of existing live pipelines, horizontal directional drilling, bending engineering, deckhand pipe lifter, Vacuworxs pipe lifter, and hydro-excavation are also offered at ITEC. 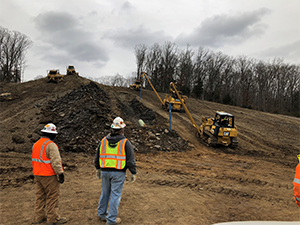 Courses at the IUOE Local 181 training site in Kentucky include John Henry rock drilling, sideboom, angle dozer, and excavator training for slope work or rough terrain. The class schedule runs 10 hours a day, 6 days a week. The program utilizes state of the art classrooms for 2 hours in the morning, followed by 8 hours of hands-on field training. Each of the classes are designed for progressive training, starting with basic techniques and adding more complex tasks as the skill level of the operator improves. The day starts with books, videos, photos, and 3D animation to give students a better understanding of the tasks to be performed in the field that day. 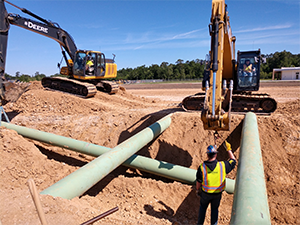 The tasks performed simulate those of a real pipeline job, with an emphasis on SAFETY, OSHA, FERC, Gas Company, and Environmental compliance. Both classroom and field training are instructed by professional pipeliners who have gained many years of experience and knowledge working in the pipeline industry, with and for professional union pipeline contractors.